Many organisations ask for predictive analysis and forecasting tools. Co-incidentally I have just read"Super-Forecasting The art & science of prediction" by Philip Tetlock & Dan Granger .Philip is the one who ran a study over 25 years to test the validity of forecasts from 284 serious experts .The result was published in 2005. The average expert was roughly as accurate as a dart throwing chimpanzee! They were no better than random guessing. They tended to have one idea and regardless of evidence that cast doubt on this idea/theory apply it. A more successful group, not much better than the chimp mind you, were more pragmatic and used multiple analytical tools and more sources of data. So how can you score much better than experts? First make sure you have a wide variety and depth of timely and relevant data and secondly do not give way to the natural instinct to just use intuition and experience. Test your conclusions- let doubt be a positive means to critique your though process. Next- every enterprise application should be an analytics and BI application.To achieve this embed an analytics platform with capable machine-learning ( follow link to review machine-learning compared with AI). Successful exploitation of machine-learning is predicated on having a wide range of internal and external data sources. Vital in order that machine-learning technology can establish the optimal range of correlations between disparate data sources to be able to identify causation and predict future outcomes. All decision makers must recognise the rising tide of data ( text, video, image, speech)from the IoT, machine sensors, data streaming, customer's mobile devices and so on. They just won't have the capacity to analyse all this so automated decision-making must be built onto workflows. This may be de facto practice in loan approval programs, credit checking, fraud detection but all types and sizes of business will need to embrace "decisioning applications" that productionise predictive analytics. Martin Butler in the report below points you to various analytics & BI technology platforms. Large enterprises may have the internal resources to deploy these whilst SME organisations will probably need a solution provider to embed such capability in a full closed-loop enterprise application. 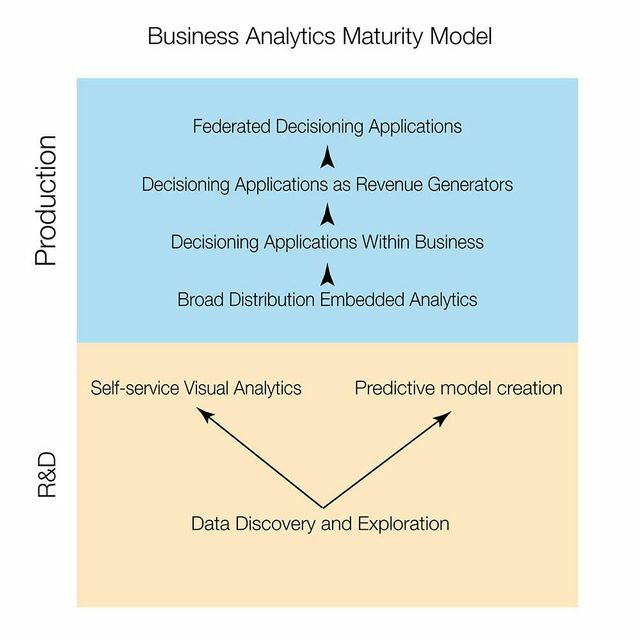 Decisioning Applications Within the Business While embedded analytics refers to the provision of useful visual artifacts within production applications, decisioning applications start us on the path toward decision automation. We’ve already mentioned the example of loan approval. Instead of a bank employee spending considerable amounts of time processing an application, loan approval analytics make the decision almost immediately and, the decisions are typically much more accurate. There is a step-change in sophistication here however, and it is problematical. Building predictive models is a highly skilled activity and many medium sized businesses will just not have the necessary skills. And so we see the emergence of solution providers. If you need to deploy decisioning applications to reduce customer churn then a large number of solutions are available. Bespoke applications may require the help of an external agent.